Today I was working on a customer POC and happened to create few Google gadgets to visualize selected data sets from *.gov.uk sites. 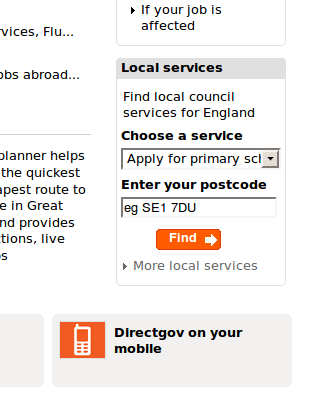 The scenario which is implemented was, mixed with inter-gadget communication and content search over data.gov.uk sites. I created three simple gadgets which communicates with each other, and one acted as the controlling gadget which pushed the search parameters to other two gadgets. The two content gadgets showed UK (1) primary school information and (2) electoral information. The pushed parameter was the postal code of different parts of UK. The direct.gov.uk has a form based implementation of this. The Requirements for the POC was, simple and we already had working samples of such a scenario at WSO2 library. And finally the two gadgets were making service calls to the mashup service and retrieved the data as an XML object, making the data processing painless. The final version at the Gadget Server looked quite appealing. Special thanks goes to Ruchira for helping me out with the mashup service 🙂 You can download the Gadget code and the Mashup service and try the scenario yourself.